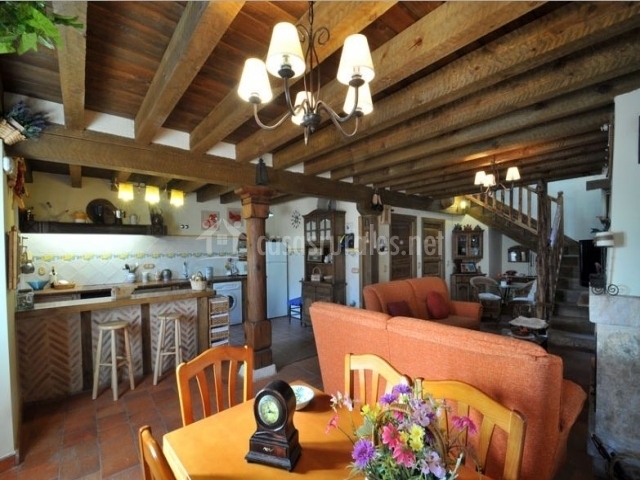 The house is located in the municipality of Caballar within the province of Segovia . It is an accommodation that divide their stays en 2 floors, que are fully equipped with furniture items that make it very pleasant and funcional. It allows a maximum occupation of 6 people that, sure, will feel like at home. A kitchen in an open space, which extends in a main front in the wood present in their closets where elements necesarios utensils and cookware are stored predominates. Among these cabinets, are also different appliances that are in perfect condition and one side, a cupboard with full al dishes. It ends delimiting the space with a bar office a we have added a few taburetes. A living room , communicated, as we said, with the previous stay and divided into 2 areas: first, the dining room consists of una wooden table with a set of chairs right next to the back of one of the sofas In part off, several sofas that precedes them side table and facing la French fireplace, which is equipped con firewood. 3 bathrooms , 2 of them inside the rooms of the house. Perfectly equipped with the key elements of these spaces, it is made very pleasant by decorating. 2 of them have bath and finally the ground floor, with una shower. For all there is towel sets. A game room en the top of the house which has a seating area with armchairs, a table and a shelf with la collection of games infantiles. Outside, one covered porch en which has installed a barbecue and wood oven and in the same space, a set of rustic furniture that is made up of a wooden table and two benches to his around. Our rural house, within the municipality of Caballar , in the province of Segovia , offers tourists a very pleasant area in which to rest in company. Being one of the quietest areas, because the population density is quite light, it is presented as one of the perfect options to disconnect from the big cities. Among the points of greatest tourist attraction, stands out, among others, the City Council , in the center of town, which has been located in one of the oldest buildings in the area and has been built there for several centuries. In addition to this, the nature areas provide the green color.